Of course, 2017 wasn’t some special year for people saying dumb things about women, particularly in cars. Women have put up with this for ages, including Cosmopolitan’s car for women, and the list below doesn’t even scratch the surface. Honestly, there were so many bad takes about women we saw this year that we had to pass on a lot of them for full articles. But they shouldn’t be missed. Listen, Jim, grandma can drive whatever she wants. She can drive a Type R, she can drive a McLaren F1, or she can drive a Toyota Camry. That’s her business, not yours, and you should stop perpetuating the stereotype that elderly women are boring, safe and not into cars—especially in a major newspaper. And let us not forget that 2017 was the year the person running Motor Trend’s Twitter account said the only reason a woman was allowed in the “man cave” was to bring in more chips and cold beer. That’s the place that names the all-important “Car of the Year” you see in commercials, folks. Wow! There were a lot of bad takes about women, particularly women in cars, this year. Let’s get to the part where we women of Jalopnik take them down. Automobile came to the rescue of us all earlier this year, announcing a total redesign meant for the modern-day car guy: a “multifaceted individual with multiple passions” like watches and cars. It was a true, brave approach at catering to an underrepresented segment of the population—especially in the automotive industry. Yeah, just kidding. It was dumb and bad. 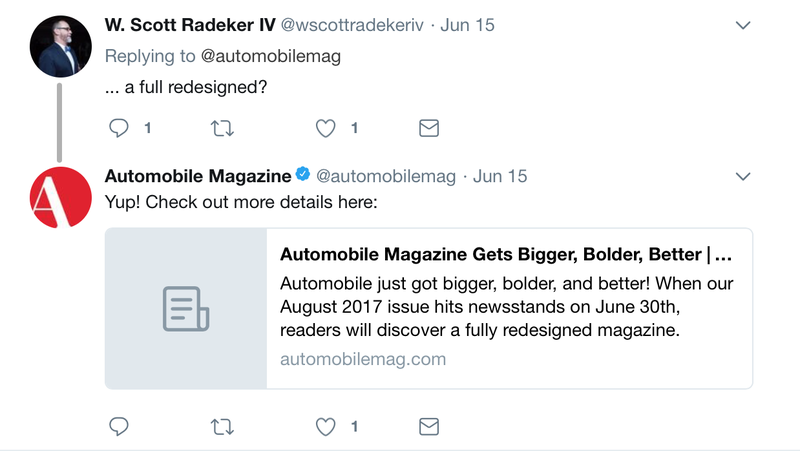 Also, the tweet announcing Automobile’s magazine for men, which was pinned to the top of its account for months, had an embarrassing typo in it. Even after the typo was pointed out, the person running the account didn’t pick up on it. Have fun with that man magazine, men. Hopefully they learn their words soon. Even the brands don’t know how to avoid glaring sexism and sending terrible messages! Who would’ve thought? This time it was Audi that messed up, producing a commercial for the Chinese market in which a future mother-in-law inspects all of the physical aspects of a bride as she’s standing at the altar—to the horror of all of the people in attendance. As the mother-in-law turns around to leave, seeming satisfied, she realizes that she forgot one thing: to make sure the bride’s chest was big enough for her son. The whole thing was meant as a comparison to shopping for used cars, and boasting Audi’s program to certify them. Don’t compare inspecting a woman’s outward appearance to inspecting a used car, Audi. That’s bad. Audi pulled the ad and apologized after it aired. In this edition of tech fuckboy has a bad opinion, a tech fuckboy amongst an entire culture of tech fuckboys had a really bad opinion about women in the car industry. The argument, published in The New York Times, covered how the men of Silicon Valley were fed up with women—obviously undeserving women—getting positions that men—obviously deserving men—previously held. How did these SV types know, deep in their hearts, that the system was rigged against them? Women..........editing a website about cars. Also, the NYT article covered an entire “movement” of people taking the “Men Going Their Own Way” route—forgoing children, staying away from marriage and limiting their involvement with women. Maybe that’s just a club for dudes who can’t get a woman to pay attention to them. It’s easy to see why. Cars are good. But if we as women don’t happen to stumble upon cars and make the conscious decision to like them, despite knowing all of the sexism and bad things we’ll have to deal with, we probably wouldn’t think any cars were for us! Why is that? Because automakers routinely put the same type of person behind the wheel in their official photos: a white man. Seriously, just about every promotional picture car companies take of their cars have the same dude behind the wheel. This, for example, would be like saying some random boy racing go-karts is “the next Kevin Magnussen.” What spectacular results has Magnussen achieved in comparison to other Formula One drivers over the years? What makes their driving styles similar? Are he and this little boy even from the same country, or do they have the same hobbies? You probably didn’t think about that, because you probably didn’t compare the two in the first place. He’s just another guy out there running in the middle of the F1 pack, and it wouldn’t cross anybody’s minds to compare him with every little boy who comes up the ranks because they are not the same. That should be the case for Patrick and all of the young girls out there, but it’s not. Because they’re rare, and they’re women, they’re all just a blur of the same. Ah, the start of an entire racing series on the premise of women being incapable of driving. Cool. Basically, a group of people wants to start an all-female open-wheel series, with a goal of being the “highest profile international racing championship second only to Formula One” within three years. The championship reached out to various female racers, asking them to drop their existing commitments and join it. The only things having an all-female racing series does is convey the idea that women cannot compete with men in motorsports, which isn’t true. This idea is bad, and it needs to end. It still has not ended. Here’s more on that same idea for an all-female championship, only this time, a former Formula One development driver got behind it—Carmen Jorda. Jorda’s really great at telling everyone that women can’t do the same things as men can, and that women “will never be the same as them.” She also thinks an all-female series will give women “the chance to achieve ... dreams and compete on an equal footing.” But that is not the case, especially in one of the few sports that’s left where women don’t have their own major leagues. As a woman with a passion for motorsports and/or cars, it’s hard enough to fit in and be accepted as an equal—equal knowledge, equal capabilities and equal everything else. Having a women’s series will only give the people who make it hard for women another reason to tell them to stick to their own series and out of the boys’ leagues. Shortly after she voiced her support of separating men and women because she believes women will never be able to compete on the same level as men, Carmen Jorda got appointed to the FIA women’s commission—a council for helping the advancement of women in racing. With the FIA being the default sanctioning body for international motorsports, the addition of Jorda to the commission was a huge blow to women trying to make actual advances in male-dominated racing series. Jorda’s not an advocate there to “fight for women in motorsport,” as she likes to say. She’s a woman who goes along with keeping the status quo—the men at the top—and that makes it easy for the people in charge. Having a woman back up the idea that they don’t have to change a thing in their top leagues is great for them, because it’s a lot less work than doing the right, more inclusive, thing. IMSA Continental Tire SportsCar Challenge racer Aurora Straus sent us an email shortly after the Carmen Jorda FIA appointment, asking if she could write why it —and the idea of an all-women series—so deeply affects female racers from the point of view of a professional female racer. Straus was one of the women contacted about the all-female racing series that Jorda supports, which she politely declined. But Straus makes incredible points about how that and Jorda’s appointment can hurt the standing of female racers trying to make it in such a male-dominated sport, and the even more deeply rooted problems it can cause when women are put on the sidelines, like grid girls, or shoved off into their own series that will get virtually no attention. Ex-Formula One driver David Coulthard, who definitely never won a Formula One championship, thinks women are biologically inferior to men in the series because of their “mothering DNA.” Wow, is that a stupid take! Here’s an idea: If you have a really stupid take, particularly if you are somewhat famous and there are recording devices around you, do not say it! Then, people won’t know what your stupid take is and publish it for others to see. Because mothering DNA is so present in women, the only conclusion we can all make is that women cannot handle Formula One cars. Women over 70 years old, especially, should never stand up out of their knitting chair. Tell that to 79-year-old rally driver Rosemary Smith, who could show up a man in an F1 car any day. Maybe we should ask Smith how she feels about mothering DNA, instead of another random dude. YouTube commenters are, in general, the worst part of the internet, which is saying something. But this time the commenters proved useful, in illustrating a point that so many people still think isn’t real: A huge chunk of the car community is not at all friendly toward women. For women who are in the car community already, most of us have gotten used to this kind of hateful behavior and don’t really care anymore. But for a woman who wants to get involved in cars, is it really inviting to read stuff like this that people (men) say about their entire gender? No, it isn’t. Being kind to people and leaving gross, sexist tendencies in the past really isn’t that hard. When Monster Energy took over the title sponsorship for NASCAR’s Cup Series and got backlash about its Monster Energy girls, the company decided to make a video that would humanize these women and tell people about their personal goals and lives. Except, the video featured a bunch of male athletes interrupting the Monster Energy girls and talking about how they’re “good scenery” at the race tracks and wherever else they are. A male athlete also said at the time he couldn’t “wait for summer” so that the women would wear less clothing. Simplifying a human down to “good scenery” is gross, as is talking about how you’d like to see women you don’t even know take off more clothes at sporting events. Don’t be gross. This year for women in cars ended on a rather good note. Formula One’s bosses said they were considering not using “grid girls” anymore—women who stand on a racing grid and look pretty while all of the male drivers get in their cars. But this story still makes the cut for the 2017 bad takes on women, because our dude Daniel Ricciardo, whom we thought was one of the good ones, said he thinks grid girls are cool and doesn’t see “any downside” to having them. Damn, Daniel. You ruined it. Not only did (male) drivers jump into the debate on grid girls, but (male) team executives did as well. And, shockingly, almost no outlets are branching out to find a woman to ask about all of this. Those are two of the main problems: most of the top positions in Formula One are held by men, and people all too often do a routine zombie walk over to those people in power in order to ask them how they feel about something. When the people in power are all mostly alike (male), they all tend to give similar opinions about issues that don’t directly affect their standing in society. That’s probably because they don’t realize it affects anyone’s standing in society. It’s the big, common “If it doesn’t affect me, I don’t care” attitude, which some people might or might not even realize they have. But when almost everyone in power has that attitude, whatever they hold power over becomes a giant echo chamber of bad ideas. Don’t be a giant echo chamber of (even more) bad ideas, F1. Mediocre F1 driver Nico Hulkenberg enlightened us all here at Jalopnik as to our grave error we made in the post above, as grid girls are necessary to the F1 grid. As Hulkenberg so elegantly said, these men and their testosterone have to see all of the “eye candy” out there before they can get in a race car and operate it. It takes a lot of work to drive an F1 car in the middle of the pack. We should all be listening to the experience and insight Hulkenberg so kindly provides. While we’re talking about Hulkenberg, he’s allergic to pink. Did you hear about those people who wear pink on Wednesdays? He thinks they’re icky and gross, not to mention mean. By the way, Hulkenberg finished behind both of the pink cars in the overall F1 drivers’ standings this year. It has to be a real curse to be such a mediocre F1 driver yet have such a large and fast-running mouth. If you remember nothing else from this life, remember that women like cars because they can do whatever they damn well please.